Mother's Day is in one week. Are you prepared? Skip the flowers and the gift certificates, and make Mom a beautiful breakfast that she won't forget. To help you out, each day this week I will post an easy, homemade, delicious recipe for a memorable Mother's Day breakfast. I have six recipes in total from which you can choose. I'm starting with an easy frittata inspired by my mom. Nutmeg has an affinity for spinach. I learned that from her. OK, so she didn't say "affinity," but she loves them together. So will you. I'm sharing my frittata with dear Nuria of Spanish Recipes, who is hosting her first blog event: Blog Your Omelete, which runs through May 15th. Fortunately, there's enough to share with Ivy of Kopiaste... Of Greek Hospitality, who is hosting a Celebrating Mother's Day event through May 10th. Melt butter in an 8-inch non-stick skillet over medium-low heat. Add mushrooms; saute 5 minutes, or until lightly browned. Add spinach and cook just until wilted. Season with salt and black pepper. In a medium bowl beat eggs. In a small bowl, mix the ricotta, 1/2 of the Grana Padano, nutmeg, salt, and black pepper. Add to the eggs and lightly mix. Pour into the skillet. With a fork, gently move the egg mixture from side to side allowing the egg to seep to the bottom of the pan. Do this for 5-7 minutes, until the eggs start to solidify and a crust begins to form around the edges. Give the pan handle a jiggle, and when the eggs appear nearly set, evenly sprinkle the second half of the cheese over the top of the frittata. Remove the pan from the stove top and place under the broiler for 4-5 minutes, or until the top puffs up and turns golden brown. Keep a close eye on it so it doesn’t burn. Let cool for a couple of minutes before slicing into wedges. Serve hot or at room temperature. Optional garnish: In a small bowl toss 1 cups of halved cherry tomatoes with a little extra virgin olive oil, salt, black pepper, and fresh herbs such as basil, dill, or parsley. Serve atop the frittata. If you'd like to make individual servings, then you can bake the eggs in ramekins. Preheat oven to 400 degrees F. Coat 6 (4 oz.) ramekins with cooking spray; place on a large baking sheet. Divide the egg mixture evenly among ramekins filling no more than 3/4's full. Bake for 15-20 minutes, or until puffed and golden. Cool slightly before serving. Serve warm or at room temperature. A delightful fritatta! Nice ingredient combo! Thanks Susan for sharing this lovely recipe with my dear friend, Nuria's event. I have bookmarked your previous frittata recipe and I have yet to make it but I will definitely make this one or the previous recipe soon. A wonderful entry for the contest, Susan! Mothers are always right so lets try this frittata and check the spinach and nutmeg affinity ;D.
I am all about ricotta with eggs. YUM! 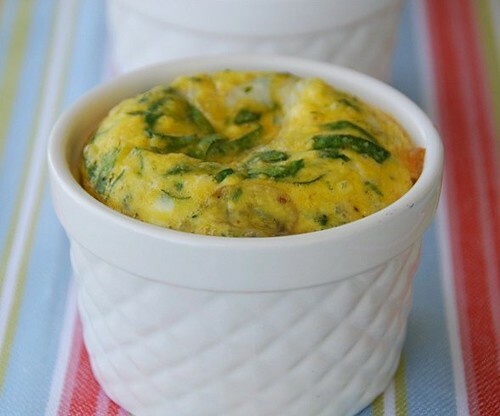 We have an affinity for anything with eggs... love the frittatas in the ramekins! I made a frittata this past weekend. Yours sounds fantastic and I like the idea of baking it in ramekins. This looks so delicious. I have noticed that you like eggs and I remember a recipe posted previously that your grandmother made. I still have it and plan to make soon. Thanks for sharing. This looks delicious with spinach! I'm getting hungry just looking at the picture! 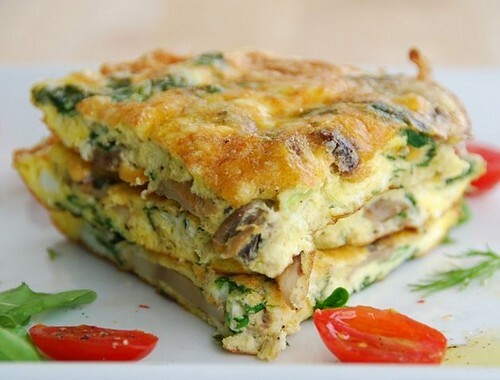 Very delicous frittata. NOthing allows for creativity quite like a fritatta! Well you know what they say about great minds thinking alike. (We do both have great minds, don't we?) This looks delicious; never thought of using ricotta in a frittata, but I bet it's creamy and delicious! the individual ones are sooo adorable! the individual ones are sooo adorable!! I love the mini frittatas in ramekins; that would make such an elegant presentation for a breakfast in bed! This would make a fabulous dinner at my house! Yum! Love the flavor combination! stacey-Ricotta souffles are lovely indeed. vinda-How kind of you. Welcome! heather-Thanks! I like them too. jamie-They're one of our go-to dinners too. Oooh, Oooh, Oooh, love this, especially in the little ramakins!